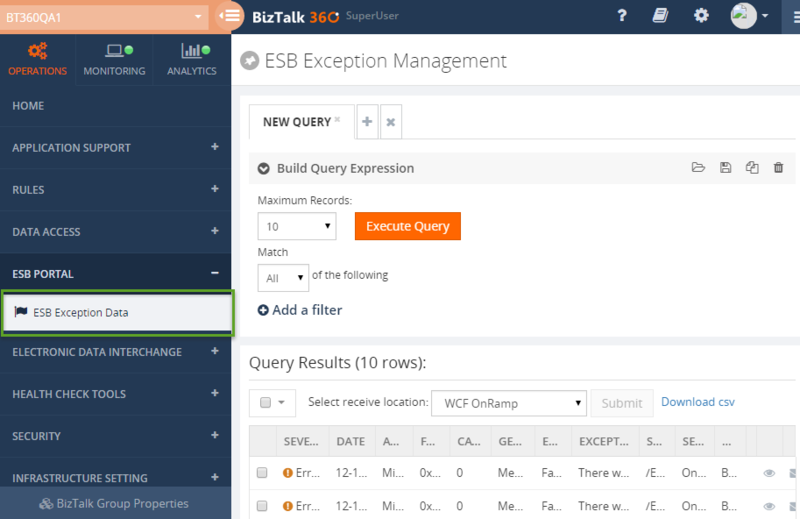 The ESB Exception Management Portal is a BizTalk360 feature that allows you to view all the ESB exceptions messages directly in BizTalk360. Organizations use the ESB exception management capabilities, that comes out-of-the-box in Microsoft Enterprise Service Bus (ESB) toolkit, to handle exceptions uniformly in BizTalk applications. The ESB Toolkit is a collection of tools that extend the service-oriented capabilities of BizTalk, but the exception management capability is one of the most widely used features of the ESB Toolkit. Even though the exception management framework is very robust and strong, the exception management portal that comes out of BizTalk Server is not that easy to configure (takes about 1 or 2 days to configure the default portal successfully). To address this problem, BizTalk360 offers the ESB Exception Management Portal with first-class integration to the ESB exception data. All it takes to set up the ESB exception management portal is to configure the database connection string to the ESB database.